A light and airy loaf, redolent of herbs (we like a mixture of rosemary, marjoram, and oregano), this is a perfect bread to make for slicing for sandwiches or toasting with soup. 2 hrs 12 mins. to 2 hrs 38 mins. 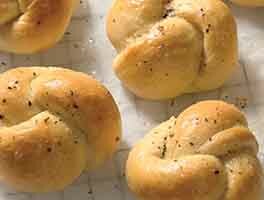 In a large bowl, combine all of the ingredients, mixing and kneading to make a smooth, very soft dough. Place the dough in a greased bowl, cover, and let rise at room temperature until puffy but not necessarily doubled (about 1 hour). After the first rise, deflate the dough and form into a large round or a long loaf. 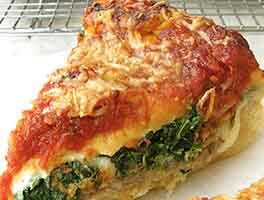 Place on a parchment-lined baking sheet, or on a piece of parchment, if you're going to bake on a pizza stone. Cover the loaf with greased plastic wrap, and let it rise for 30 to 45 minutes, until noticeably puffy. While the loaf is rising, place a pizza stone in the oven and preheat it to 375°F. When the bread is almost doubled, uncover it and slash the top a few times. Bake for 30 to 35 minutes, until the center measures 190°F when measured with a digital thermometer. Remove from the oven and cool for 30 minutes before slicing. Store wrapped at room temperature for 4 days, or freeze for longer storage. 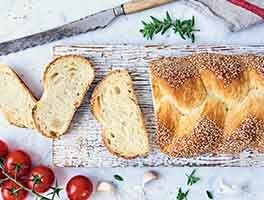 In Tuscany, bread is traditionally served with salty partners like olives, Pecorino Romano and Parmesan cheeses, or salt-cured meats like prosciutto. 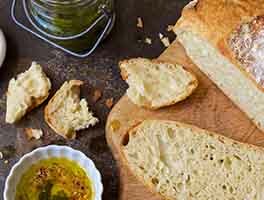 While Tuscan bread is traditionally made without salt, we find that saltless bread tends to taste flat to most Americans; thus we add salt here. As a result of reader feedback, as of 7/10/17 we've increased the flour in this recipe from 3 1/4 cups to 4 cups (17 ounces). The greater amount of flour makes the dough easier to handle, without noticeably affecting the bread's light texture. 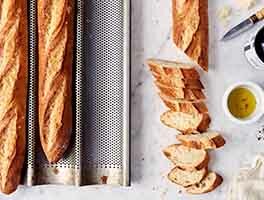 This is my absolute go-to bread recipe! I have made it so many times I pretty much have it memorized. It is so quick, fluffy, and delicious - it can also be a real self-esteem booster if you have been failing at sourdough loaves that take days. Whenever I have a work potluck, party, or want to give a loaf to a neighbor I make this one! I volunteer with Meals on Wheels and this loaf is a super hit with one of my clients. She ate it for days as sandwich bread but it also works with oil and balsamic, cheese, everything. Time-wise it is awesome as far as homemade bread goes - you can easily set this up, work on other stuff around the house, and then pop this into the oven. 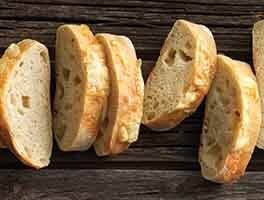 I am always amazed at how this simple recipe can produce bread that tastes so freaking good. very good. it is indeed a rather wet dough. I couldn't get it to brown very well, which I'm guessing may be because it is fairly wet. I made this to go with a shrimp, white bean, and Italian sausage stew. I used a full 2 teaspoons of Diamond Crystal kosher salt and I thought the finished bread needed more, so next time I'll use a tablespoon of the Crystal or the smaller amount of fine sea salt. The dough went together well, but I ended up kneading it in my KitchenAid for nearly 20 minutes before I got a windowpane. I made 2 loaves that I put in my Italian loaf pan. After they baked for half the time, they weren't browning, so I switched to convection baking and they browned beautifully during the second half. They were nice loaves with the crispy crust and chewy texture that I prefer. I didn't have the pizza seasoning, so I used Penzey's Mural of Flavor. Very easy, delicious chew and fragrance. I added a little more herbs based on reviews. And I braided it for the fun of it. Thanks for another great recipe. Wonderful! I made this in my dutch oven. It looks and smells amazing, and is a great one-day bread recipe. Does anyone have an idea for adapting this recipe with different spices or flavor profile? So pleased with the results of this recipe. I put the dough in a greased bowl for the first rise and used my bannetone for the second rise. Very easy to just flip the bannetone and drop the dough on the hot baking stone and score the top. Both rise times were accurate and so was the bake time, using a baking stone and 375 deg oven. Made the bread for dinner guests. Everyone loved it! I think that this is the recipe that I first found on a bag of your AP flour. I did not write that down, and I am hoping that this is the same. That original recipe was fantastic. I am hopeful that this will be the same. I am down to the last few minutes of baking and it looks astounding and smells amazing. I see that there are changes from what I used to make. I will keep you posted. Has anyone used a cloche to back this bread? I was thinking of doing that but wasn't sure if a good idea. I made this, and my wife and her girlfriend said it was the best bread that they'd ever had!